Yesterday I met with a company that I will be interning with while I am in Tokyo. The internship was organized through the Pennsylvania International Business Development Office (and my cousins Debra and Bernie), but I will be working with a company called Yamano & Associates. Basically the affiliation Yamano has with Pennsylvania is that it tries to promote foreign direct investment of Japanese companies into Pennsylvania. It tries to get Japanese companies, i.e. Sony and Olympus, to build factories and offices throughout the state. Apparently, Pennsylvania recently passed a bill requiring twenty percent of the state’s energy to be powered by alternative sources by 2020, such as wind and solar. So the office in Tokyo tries to match Japanese companies who are in that industry to make proposals and invest in the project. I only met with them briefly (I start working tomorrow), and still don’t know my defined role in any of the projects, but they were all very friendly and I am excited to get valuable experience and exposure to an international business environment. This internship will certainly enhance my study abroad experience and allow me to see more of Tokyo that I otherwise would not (they already promised me a tour of the US Embassy!). After I left my internship, I went to class and then met a woman who works with my boss in the Admissions Office in Philadelphia. Her name is Holly and she works in the deans office at TUJ, and she sent me an email introducing herself and told me to stop be her office to say hello. So I did, and she asked my impression of Japanese food. After I described to her my dilemma and fear of trying some Japanese cuisine, she made it her obligation to feed me and she is organizing a dinner to take me and several of her favorite TUJ students out so that I can try authentic Japanese food. I am not sure whether or not I should thank her yet for this, but it is certainly a nice gesture and hopefully I will like the food I try and continue to eat it while I am here. I also told her of my internship, and when I told her what company it was with, she told me that she knew many people who worked there personally! Who would have thought that in such a huge city, that connection would be there! But she assured me they are very nice people and fun to work with. One of the truly exciting parts of my study abroad experience is that I really don’t know what to expect. I can read pages of books and hear people tell me of what a wonderful city Tokyo is, but going to a place whose culture, language, and lifestyle are astronomically different than my own makes it difficult to completely associate myself with what lies ahead. My comfort zone has vanished, which is necessary for the experience to be successful. Already, I have seen such differences in communication, food, and etiquette that have expanded my appreciation for Japanese culture. Today, for example, I went to a restaurant for lunch, and based on a picture on the menu, I ordered something that looked like beef and vegetables. I did my best to speak to the waitress, who suggested to me that I did not know what I was ordering. But, I thought maybe it was all confused in translation, so I ordered it anyway. When I received my meal, I wish I had taken the waitress’s advice. It looked like some type of Korean tofu, and it was cold. I tried a tiny piece, and it didn’t taste like anything, but I couldn’t get past the texture. I ate the vegetables that it came with, and they were okay (not great though), until the waitress came over and felt really bad that I did not like it. I explained that the vegetables were good (using the little Japanese I know how to speak), so she prepared me a whole dish of the vegetables for me to eat! She was very kind and not offended since she realized we were foreigners…that probably isn’t something that a waitress in America would do for a foreign customer who didn’t like their food! After returning home, I Googled “Korean Jello,” because that is what it looked like, and it turned out to be “Do-to-ri Mook”, a Korean dish made from acorns. Needless to say, I do not regret not eating it! We were taken on a trip to another part of the city today, Shibuya. This place was amazing, comparable to Times Square in New York City. There were millions of people, many shops, and the largest grossing Starbucks in the world! A current TUJ student walked us around and showed us many of the nightlife hotspots, and I ate McDonalds for the first time in Japan. I told myself that I wouldn’t do it, but I gave in. Let me just say that the food is significantly better here than in the US! And it is actually fast food…my order was completed in about two minutes! We continued to walk around this metropolis, when all of a sudden we stumbled upon this large forest. A wide path cut through the trees and led to a sacred Japanese shrine. I am not sure exactly what it meant, but it was neat to see. We left the shrine and walked around the city some more, fighting through crowds of tons of people. We returned home, and I planned on taking a short nap and going back out later in the evening. I fell asleep at 5pm and did not wake up until 2am! All of that walking wore me out! So following a very painful 18 hour flight originating in Philadelphia, I arrived in Tokyo yesterday to begin my journey as a study abroad student at Temple’s Japan campus! However, my travels did not end at the airport. After claiming my baggage, going through customs, and converting my USD to Yen, I next sat on a bus for two hours which took me from the airport to a hotel located in downtown Tokyo. We were greeted by friendly TUJ (Temple University Japan) staff, who then sent us in a cab to our final destination, Ontakesan Dorm. At last, I was able to drop my bags and unpack into what will be my residence for the next four months. I was given a tour of the building, took a shower, and then passed out in my bed by 9:00! I was so exhausted after the nearly full day of travel. However, the fourteen hour time change left me jet lagged and woke me up by 4:30 am. I started the morning by chatting with many of my friends from home on the internet, letting them know I arrived safely and so far having a positive outlook on what is to come. Then, me and a friend I met on my flight from Philadelphia to San Francisco walked around the neighborhood to a convenience store where I bought my breakfast…a Japanese chocolate pastry and Japanese orange juice. Both were delicious, and I topped it off with a good pot of American Starbucks coffee, brewed in the coffee maker I brought along for the trip! We had orientation all day which started at 8:00 am to go over the rules of the dorm…fun stuff, I know. But then we had our first venture into downtown Tokyo to see Temple’s two academic buildings. The first part of the adventure, though, was purchasing the ticket for the train, which was made difficult because I can’t exactly read Japanese very well! But I managed, and with the help of a current TUJ student as our tour guide, we arrived at Azabu Hall, Temple’s main academic building. Most of my classes, however, will be in Mita Hall, home to TUJ’s business program, located just a short five minute walk from Azabu. We toured the neighborhood, and went to a restaurant for lunch. Again, my lack of Japanese language skills forced me to point on the menu to what I wanted to order. Luckily, the menu included pictures so I was able to get an idea of what I would eat. After lunch, we returned to Azabu where we were overwhelmed with information and instructions of things we have to do as students in Japan, like alien registration cards, and train passes, and cell phones, and blah blah blah. I wish there was more exciting information to share about that, but it was quite boring. But finally, by 4:45, we were on our way back home. We got on the train, were moving right along, until we were stopped at the station right before the one we were to get off at. The train sat idle for nearly a half hour, apparently because somewhere along the train route, there was an earthquake. We were told it was a common thing, given that Japan is the most seismic country in the world with five tectonic plates beneath it. Soon enough, they had us moving again, and when we got off the train, my friend Josh and I ventured out for authentic Japanese cuisine. There were many restaurants we peaked into, and finally settled on one and went in. Of course, no one spoke English, so again, I just pointed to what looked good. I think it was pork and noodles in some type of broth, but I cannot be sure of that. I am typically a somewhat picky eater, but I figure I came here for a totally new experience, so now is not the time or place to be picky. In all, it tasted pretty good. There was lots of catch up to do once I arrived back in Philly since classes had already started the week before, hence the reason why my blog has remained stagnant for a bit of time. While I love Philadelphia, the political climate certainly differs from my two weeks in Minneapolis. Let’s just say that my “McCain-Palin” button is not very well tolerated. Until the deadline of voter registration, Obama supporters stood on nearly every corner registering people to vote. Two things baffled me with their efforts. For one, I think that voter registration should be non-partisan, therefore all of the Obama signs, buttons, and t-shirts displayed by the volunteers were unnecessary. Talk about intimidating anyone who would think of registering Republican! While I would never go out of my way to talk to these people, I loved it when they would ask me if I was registered to vote, and I would respond with: “Yes…Republican.” Nine times out of ten, that spurred further political debate which is always enjoyable for me. The second thing that made me laugh with regard to these people is how, up until the very last day of voter registration, they remained persistent in asking every person who walked by if they were registered. College students are notoriously unreliable to actually go the polls on Election Day. Therefore, what are the chances that a student who waited until the very last day to register to vote will actually show up on Election Day? Since being back, I have also begun preparations for my semester in Tokyo! My flight is booked, and I am set to leave on January 5. Aside from my Japanese class, which is probably the most challenging class I have taken since I have been at Temple, I have mostly been filling out paperwork to apply for my visa. More on those preparations as they happen. Thursday night capped off what I would consider to be a very successful convention for the GOP. The stage was rebuilt for John McCain’s keynote speech to jut into the crowd. 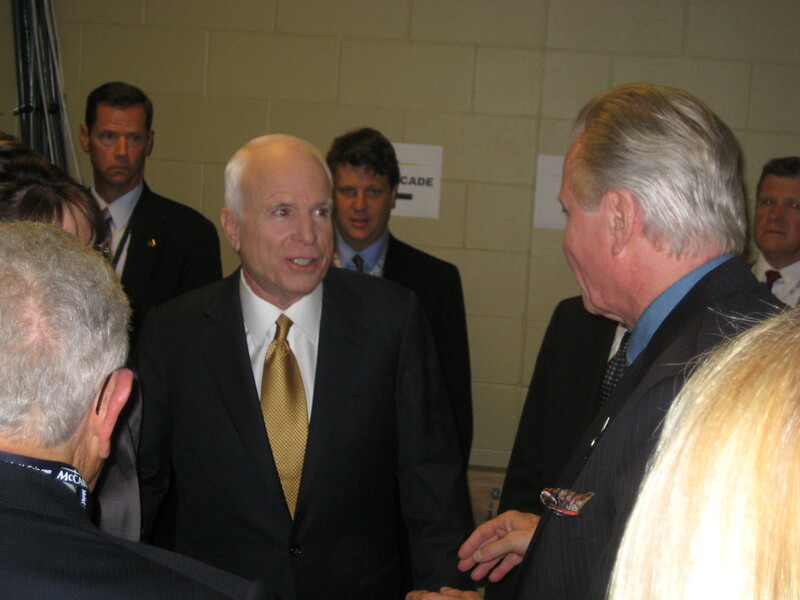 The lineup of speakers was not as powerful as the night before, but everything would come to fruition once McCain himself accepted the nomination. Former Pennsylvania Governor Tom Ridge spoke and helped to reinforce why Sarah Palin was picked as VP. Ridge had been speculated to be selected as McCain’s running mate, but after he spoke, I realized how crucial it was for someone like Sarah Palin to be chosen. 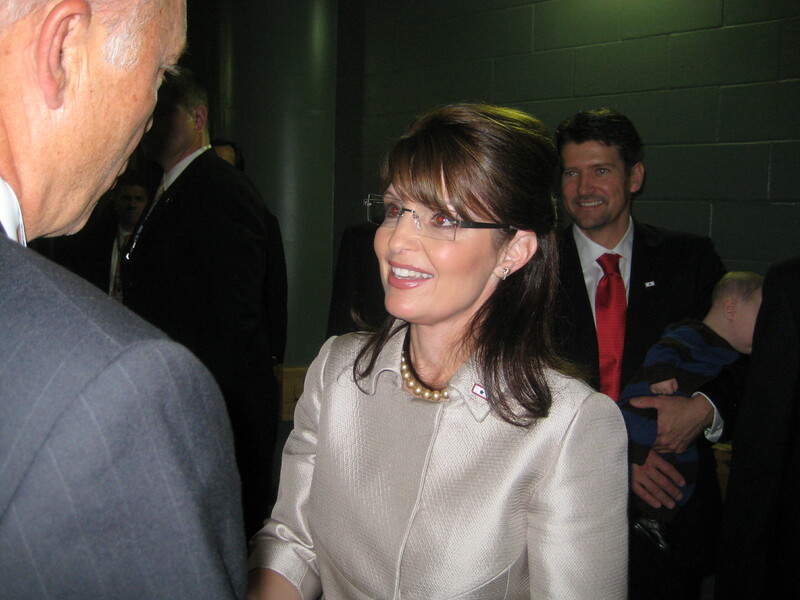 In my opinion, the enthusiasm and excitement of the entire convention was focused on Palin, and if anyone else, like Ridge, Romney, or Pawlenty (who all spoke), gave the Vice Presidential nominee address, the convention would not have been nearly as successful. In case you hadn’t heard, as many people watched Palin’s speech as Obama’s, and even more watched McCain’s. This is amazing considering the Republican party should have been completely defeated before the campaign season even started given the current administration’s negative approval. I think it’s all going to come down to the Republicans obtaining a completely untapped demographic, working mothers and soccer (or hockey) moms, which is going to put them over the top. Also speaking Thursday night, just prior to John McCain, was Cindy McCain. I have to give her a lot of credit for all of the great mission work she has done around the world, but she is as dry as a bone and not a very good public speaker. But I guess it is quite difficult to try and hold her to the same standard as Laura Bush! When John finally entered the stage, the place went wild. He was warmly greeted by ten minutes of applause, and was frequently interrupted by even more applause throughout his speech. In my opinion, his speech wasn’t all that great either. The content was there, but like his wife, he is not very exciting to listen to. Even still, it was a thrill for me to be there and hear a tremendous story about a war hero who is going to be the next president of the United States! After his speech, the celebration began. 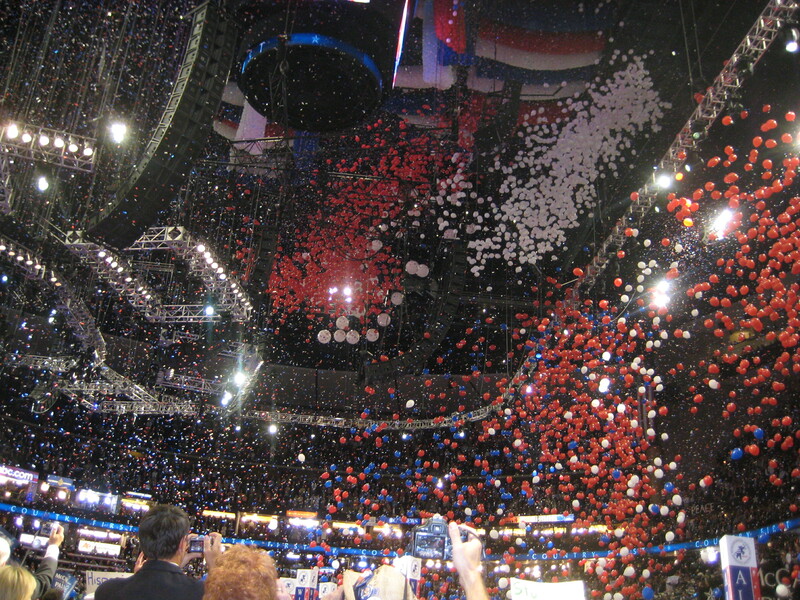 Millions of balloons and confetti fell from the ceiling as people cheered and danced. 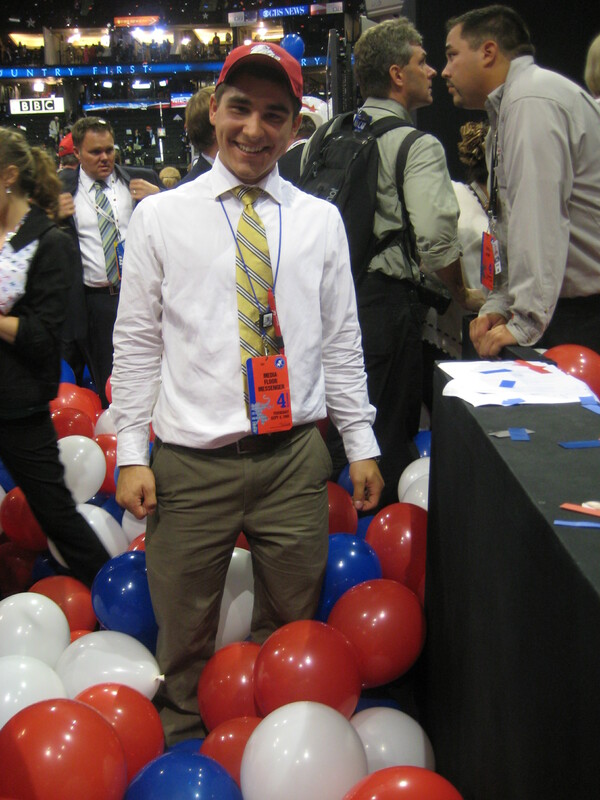 Walking around, I was knee deep in balloons. Aware of all of the other people I had run into previous nights of the convention, I then hung around the back tunnel where John McCain was sure to exit. 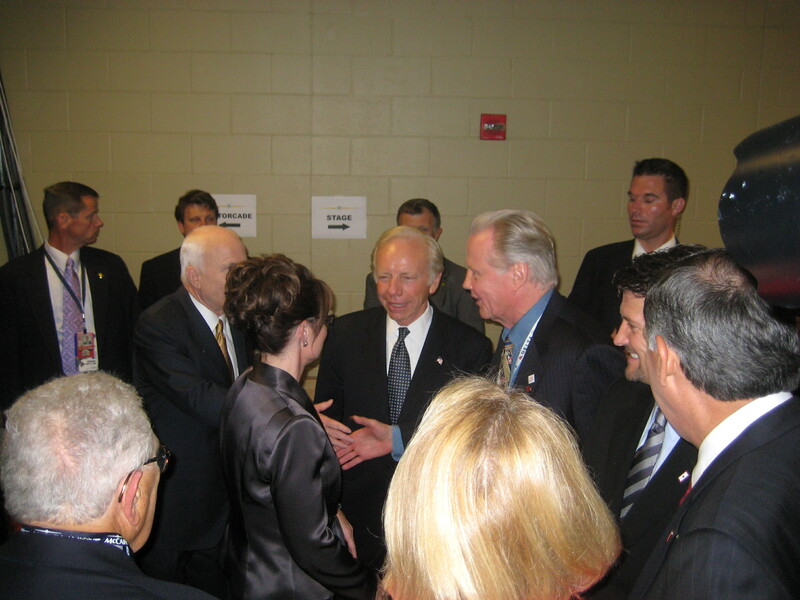 I got there just in the nick of time, and he was already there shaking hands along with Cindy McCain, Sarah Palin, Joe Lieberman, and John Voight. There were a few people standing in front of me so I wasn’t able to shake any of their hands, but I did get some great pictures of all four of them. I would finally like to extend some thank-yous and acknowledgments to the people that made this a great and successful experience for me. First, to Dr. Ruth Ost and the Vice Provost’s Office that initiated and funded the program. Second, to Dr. Robin Kolodny, who prepared me so well for what I experienced in her class I took in the spring. Lastly, to my parents, who always support everything I do. What an unbelievable experience the last two weeks have been for me. Having got a taste of what a convention is like, I know for sure that Minneapolis will not be the last city I visit for a Republican National Convention. The true question is not if I go to another convention, but in what capacity (perhaps delegate, congressman, senator, or nominee!)? Admittedly, the gloves came off last night and many of the speeches by the keynote speakers criticized Barack Obama. The big guns of Mitt Romney, Mike Huckabee, and Rudy Giuliani all threw punches at Obama, but I still think that they balanced it well with complimenting and promoting John McCain and Sarah Palin. Rudy spoke right before Sarah Palin, and really got the crowd fired up with a very entertaining speech. But when the Governor of Alaska was announced, the roof nearly flew off the arena. The place erupted with cheers and excitement as Sarah Palin took the stage. With millions of people watching around the world (perhaps even more than watched Barack Obama a week ago), she delivered a phenomenal speech that surely gained the attention of Republican, Independents, and Democrats alike. Following her speech, I ran the digital camera cards to the darkroom, and then I realized that she was likely to walk by. I waited there for about fifteen minutes, and then she was in sight. As she walked down the hallway, she shook every persons hand. She stopped right in front of me and started talking to the Congressman that I was standing next to. I took a great picture of her, and her husband and child are also in the background. Then she came to me, I was able to shake her hand as well. To me, this reveals her genuine and sincere personality and her ability to relate to the common person, and is why I think she is going to win John McCain this election!